The ignition and fuel systems are highly important to the emission control system and to effi cient engine operation. Do not tamper with them. All inspections and adjustments must be made by an expert repairer, we recommend an Authorised Mazda Repairer. I : Inspect: Inspect and clean, repair, adjust, fi ll up, or replace if necessary. *1 In the countries below, inspect the spark plugs at every 10,000 km (6,250 miles) or 12 months before replacing them at the said interval. *2 If the vehicle is operated in very dusty or sandy areas, clean and if necessary, replace the air fi lter more often than the recommended intervals. 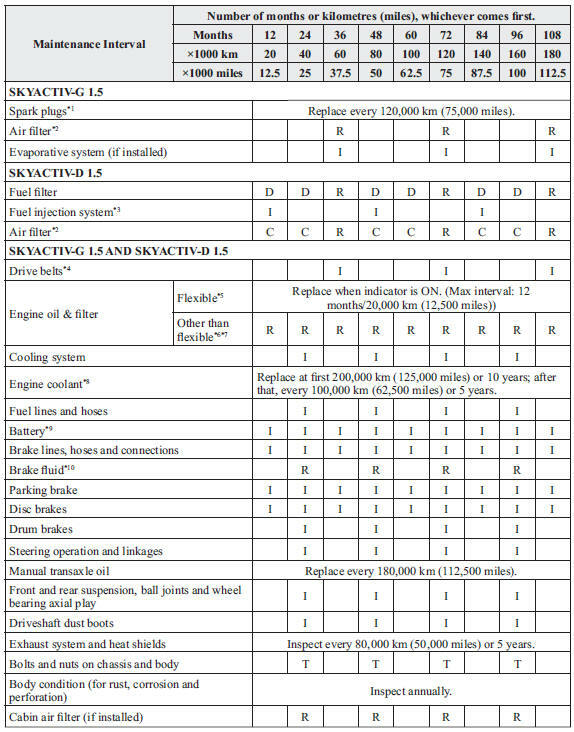 *3 Implement the fuel injection amount correction. *4 Also inspect the air conditioner drive belts, if installed. If the vehicle is operated primarily under any of the following conditions, inspect the drive belts at every 20,000 km (12,500 miles) or 12 months . *5 SKYACTIV-G 1.5 vehicles can select fl exible setting only some countries in Europe. Consult an Authorised Mazda Repairer for details. 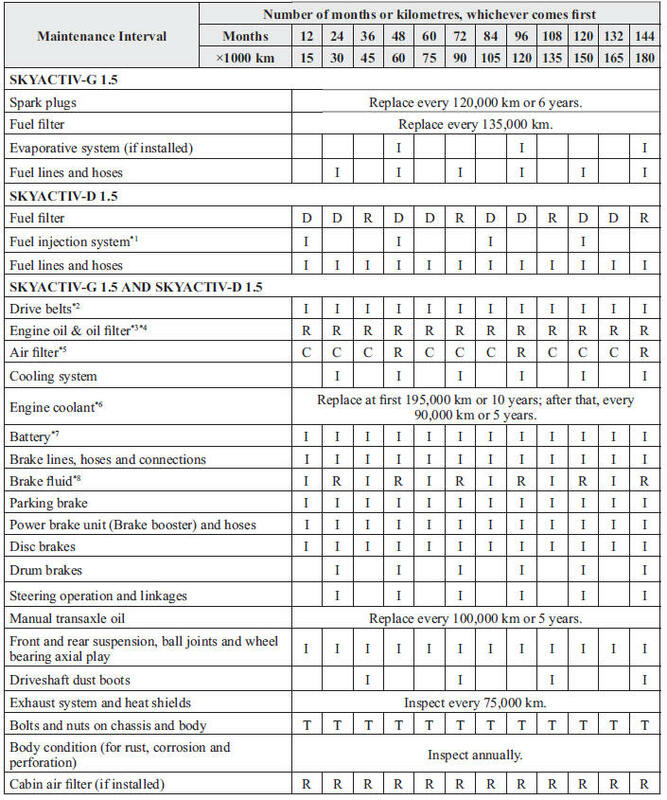 Flexible setting can be set if the vehicle is operated mainly where none of the following conditions apply. Purpose of vehicle use is police car, taxi or driving school car. Once the fl exible maintenance is selected, the vehicle calculates the remaining oil life based on engine operating conditions and lets you know when an oil change is due by illuminating the Wrench Indicator Light in the instrument cluster. Replace the engine oil and fi lter when message/Wrench Indicator Light is ON. And they must be changed at least once a year or within 20,000 km (12,500 miles) since last engine oil and fi lter change. The system must be reset whenever replacing the engine oil regardless of the message/wrench indicator light display. *6 If the vehicle is operated primarily under any of the following conditions, replace the engine oil and oil fi lter at every 10,000 km (6,250 miles) or shorter. *7 For SKYACTIV-D 1.5, reset the engine oil data after replacing the engine oil. *8 Use of FL-22 is recommended when replacing engine coolant. Using engine coolant other than FL-22 may cause serious damage to the engine and cooling system. *9 Inspect the battery electrolyte level, specifi c gravity and outer appearance. The sealed battery only requires an outer appearance inspection. *10 If the brakes are used extensively (for example, continuous hard driving or mountain driving) or if the vehicle is operated in extremely humid climates, replace the brake fl uid annually. *11 Tyre rotation is recommended every 10,000 km (6,250 miles). *12 The Tyre Pressure Monitoring System (TPMS) initialization must be performed so that the system operates normally (if equipped). *13 Check the tyre repair fl uid expiration date every year when performing the periodic maintenance. Replace the tyre repair fl uid bottle with new one before the expiration date. *1 Implement the fuel injection amount correction. *2 Also inspect the air conditioner drive belts, if installed. If the vehicle is operated primarily under any of the following conditions, inspect the drive belts at every 10,000 km or shorter. *3 If the vehicle is operated primarily under any of the following conditions, replace the engine oil and oil fi lter at every 10,000 km or shorter. *4 For SKYACTIV-D 1.5, reset the engine oil data after replacing the engine oil. *5 If the vehicle is operated in very dusty or sandy areas, clean and if necessary, replace the air fi lter more often than the recommended intervals. *6 Use of FL-22 is recommended when replacing engine coolant. Using engine coolant other than FL-22 may cause serious damage to the engine and cooling system. *7 Inspect the battery electrolyte level, specifi c gravity and outer appearance. The sealed battery only requires an outer appearance inspection. *8 If the brakes are used extensively (for example, continuous hard driving or mountain driving) or if the vehicle is operated in extremely humid climates, replace the brake fl uid annually. *9 The Tyre Pressure Monitoring System (TPMS) initialization must be performed so that the system operates normally (if equipped). *1 Also inspect the air conditioner drive belts, if installed. 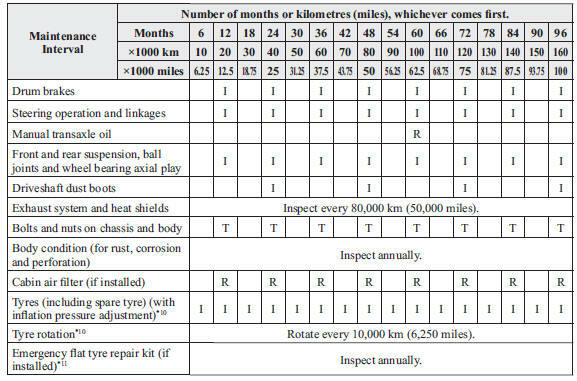 If the vehicle is operated primarily under any of the following conditions, inspect the drive belts at every 7,500 km or 6 months. *2 If the vehicle is operated primarily under any of the following conditions, replace the engine oil and oil fi lter at every 7,500 km or 6 months. *3 If the vehicle is operated primarily under any of the following conditions, replace the engine oil at every 2,500 km or 3 months. *4 If the vehicle is operated primarily under any of the following conditions, replace the engine oil fi lter at every 5,000 km or 6 months. *5 Use of FL-22 is recommended when replacing engine coolant. Using engine coolant other than FL-22 may cause serious damage to the engine and cooling system. *6 If the vehicle is operated in very dusty or sandy areas, clean the air fi lter at every 7,500 km or 6 months. *9 Tyre rotation is recommended every 10,000 km. *10 The Tyre Pressure Monitoring System (TPMS) initialization must be performed so that the system operates normally (if equipped). *11 Check the tyre repair fl uid expiration date every year when performing the periodic maintenance. Replace the tyre repair fl uid bottle with new one before the expiration date. 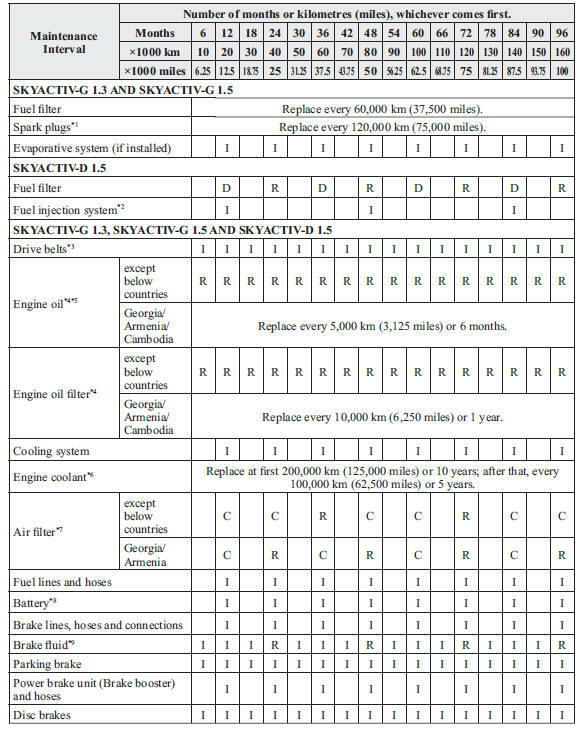 Armenia, Angola, Bolivia, B.Virgin, Cambodia, Costa Rica, Curacao, El Salvador, Georgia, Guatemala, Haiti, Honduras, Hong Kong, Jordan, Macau, Myanmar, Nigeria, Nicaragua, Peru, Syria *2 Implement the fuel injection amount correction. *3 Also inspect the air conditioner drive belts, if installed. If the vehicle is operated primarily under any of the following conditions, inspect the drive belts more often than the recommended intervals. 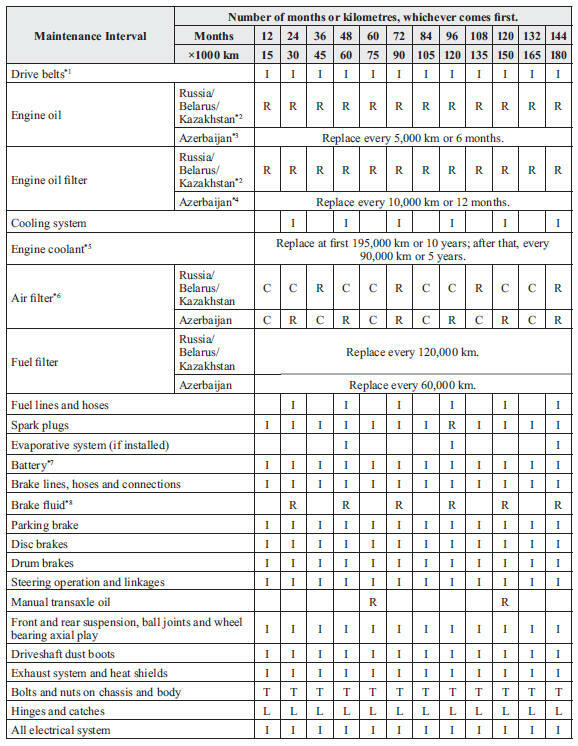 *4 If the vehicle is operated primarily under any of the following conditions, replace the engine oil and oil fi lter more often than the recommended intervals. *5 For SKYACTIV-D 1.5, reset the engine oil data after replacing the engine oil. *7 If the vehicle is operated in very dusty or sandy areas, clean and if necessary, replace the air fi lter more often than the recommended intervals. *8 Inspect the battery electrolyte level, specifi c gravity and outer appearance. If the vehicle is operated in extremely hot and cold areas, inspect the battery electrolyte level, specifi c gravity and appearance every 10,000 km (6,250 miles) or 6 months. The sealed battery only requires an outer appearance inspection. *9 If the brakes are used extensively (for example, continuous hard driving or mountain driving) or if the vehicle is operated in extremely humid climates, replace the brake fl uid annually.